"This is a Period of Wealth Destruction"
Will We Stop on Lucky Number 13? "A Lot of Hoarding Is Starting"
More Money Means Lower Food Prices!! May 30 (Bloomberg) -- Eastman Kodak Co., the photography company reshaping itself in the digital age, said it will raise prices as much as 20 percent on products including paper, film and printing plates to counter higher raw material costs. Clearly a 20% increase is not exactly cheaper prices I must admit. Humor me though. I'm trying to be an optimist. The prices take effect July 1 and will vary by product and region, the Rochester, New York-based company said in a statement today. The increase will help ease the effect of higher costs for silver, aluminum and oil, spokesman Chris Veronda said. Since today is the 30th of May, you still have 31 days to save 17%. In other words, prices right now are 17% cheaper relative to what they'll be on July 1st. Just think of it as a sale in reverse. How big of a sale is 17%? It's a HUGE sale! Back up the truck. That's NINE full years of three month treasury bill interest (1.89%)! Woohoo! I must apologize. I never thought we'd see 20% returns on investments again. Clearly I was wrong. I'm really liking this whole optimist mindset. Feeling good. Feeling real good. I'm having the very strange sensation of deja vu. The exact bulb shown in the picture costs $5.99 at Safeway. I noticed it today while picking up a birthday cake for my girlfriend. A three-pack of the exact same bulbs costs $7.68 at Wal-Mart (if memory serves, which I believe it does). I bring this up because Puget Sound Energy coupons are available at Wal-Mart (here in Washington State). They give you $2 off per bulb. You can actually use three coupons on each three-pack (it says so right on the coupon). That brings the cost per bulb down to $0.56 a bulb (before sales tax). Want some price deflation? I'm offering 93% off. Puget Sound Energy is practically throwing money at us. I've been certainly taking advantage of my fair share of it. The coupons can be hard to come by as they tend to go quickly. The last time I was at the South Center Wal-Mart (Seattle area) I saw a note that redirected you to extra coupons at the paint counter. It seems one employee at that particular store has made it his/her mission to see that we don't pay full price for the bulbs. I congratulate him/her. One reason the coupons tend to go quickly is that there is a limit of 12. You buy FOUR three-packs and you end up using TWELVE coupons. Who is the rocket scientist over at Puget Sound Energy who thought that one up? They are full color coupons printed on high quality paper and nearly suitable for framing. Let's hope these "highly efficient" coupons didn't cost more than 56 cents each to make. Out of curiosity, who pays for that in the end? That's not the rant. That's just the setup for the rant. Get ready for it. Brace yourself. I think I know who pays for it. We do! Big shocker, huh? By year's end, Puget Sound Energy customers could be paying their electricity and natural-gas bills to a utility owned by an Australian investment bank and Canadian pension funds. That's just perfect. We already pay foreigners for our oil. This will complete the energy policy picture. Q: The consortium of buyers is borrowing about $4.2 billion. Doesn't that raise a red flag about the financial stability of the utility? A: Yes, ffitch said. That much debt financing could put pressure on the company to ask for future rate increases. While the amount of debt financing could be a concern, PSE faces the same sorts of challenges as a stand-alone company, DeBoer said. Oh that just frickin' figures. Although we've sent SO much money overseas through our massive trade deficit, the buyers would prefer to use debt anyway. We'll be rolling in even more debt-based prosperity before you know it. Q: What has been the reaction to the proposed sale since it was announced in October? A: The buyout has triggered grassroots initiatives on Whidbey Island and in Skagit and Jefferson counties to study the feasibility of public utilities taking over electrical service there. Puget officials have said they would take legal action to halt such moves. In addition, opposition to the utility sale and rate increase is running about 95 percent from the more than 8,000 public comments received by the UTC, commission spokeswoman Marilyn Meehan said. One only wonders what the five percent must be thinking. Oh well, it isn't like we have much of a choice. At the first hint we won't sell them our utilities they'll probably just bid up the price of oil instead. I'm a big believer in The Laws of Unintended Consequences and therefore see no easy way out of our predicament. Can anyone seriously deny that it couldn't get worse? That's just predicting a continuation of the current trends. We've had the equivalent of thirteen 20% increases in oil since the bottom in 1998. Why are we suddenly worried about the fourteenth or the fifteenth? But the long-term energy outlook perhaps is even more frightening for America, the world's biggest energy consumer and largest importer of oil. Illusion of Frickin' Prosperity. That's what I should have named my blog. The nearly idle terminal is a monument to a stalled experiment, one that was supposed to import so much LNG from around the world that homes would be heated and factories humming at bargain prices. Andrew Grams, head of North American power and gas trading at Deutsche Bank, said the United States may eventually pay dearly for not importing more LNG now. He calculated that given the reduced LNG imports and expected energy use through the summer, the country will have only 3.1 trillion cubic feet of gas in storage at the end of October — almost 1 trillion cubic feet below full storage. Under a normal scenario, that's just barely enough to get through winter," Grams said. "It doesn't take a rocket scientist to figure out that we may not get enough LNG supply in the United States unless our pricing structure becomes more competitive with the rest of the world." According to a calculation by Joachim Fels, managing director of Morgan Stanley, the global weighted average inflation rate will be 5.4 per cent this year, while the global money market interest rate is currently only 4.3 per cent. This means that global short-term real interest rates are negative — at a time when inflation is rapidly accelerating. As monetary policy has been excessively accommodating for more than a decade, inflationary pressures have built up in the global economy. This was concealed initially by a series of asset price bubbles. But when too much money finally stopped chasing too many assets, it started chasing too many goods. On Wednesday, Dow Chemical (nyse: DOW - news - people ) announced it would raise product prices across the board by up to 20.0% to offset the rising costs of energy, raw materials and transportation. Chairman Andrew N. Liveris blamed the United States government’s failure to develop a sound energy policy that has led to the company’s attempt at mitigating astonishing rise in energy and raw material costs. The price increases will depend on each product’s exposure to the rising costs associated with it and will take effect June 1. Since today is the 28th of May, you still have 3 days to save 17%. In other words, prices right now are 17% cheaper relative to what they'll be on June 1st. Just think of it as a sale in reverse. How big of a sale is 17%? It's a HUGE sale! Back up the truck. That's NINE full years of three month treasury bill interest (1.89%)! Woohoo! Another type of bad financial advice tells us to get a safe job, save money, live below our means, buy a house, get out of debt, and invest for the long term in a well-diversified portfolio of mutual funds. On those financial TV shows, I get into the most head-butting with the so-called financial experts who subscribe to this philosophy. Yes, it is much better to get an unsafe job, spend money, live above your means, sell a house (preferably to a subprime borrower), get into debt, and invest for the short term in an undiversified portfolio of unknown funds. That sounds fantastic! Sign me up! I'd be "head-butting" too! That's because, according to the Census Bureau, in 1999 the average U.S. income was $49,244. By 2006, the average income declined to $48,201. This means that U.S. workers haven't had a pay raise for seven years. So much for the advice about getting a safe job -- it's the opposite of rich advice. We need to make THIS guy our next president. If we all became rich, nobody would need jobs. Genius! Why didn't anyone else think of that? The first step is to apparently quit the job you have. It is clearly going nowhere. Untold riches await you! Moreover, in January 2008 the Federal Reserve Board dropped the interest rate twice over a period of just eight days, by a record 1.25 percent. If my crystal ball is accurate, I expect another .5 percent drop sometime later this year. Savers are actually losers, then, because interest rates are low and inflation is high. So urging people to save money isn't rich advice, either. Yeah, it is much better to just burn through all the savings and have nothing left. Heck, spend even more than that. Use debt! That'll show 'em! Don't even get me started on Warren Buffett. That fool is sitting on a $35 billion war chest ("savings") waiting for opportunities. Don't be like him. Quit your job and spend money like a drunken sailor before the government gets it! The dollar is lower than ever against the euro, gas prices are higher than ever, Egyptians are rioting over food shortages and Sam's Club is rationing rice. Such upheaval aside, it's business as usual on Wall Street: Small investors are repeating past mistakes by focusing on the market's short-term troubles rather than on their own long-term objectives. Business as usual on Wall Street? Yeah, pretty much unfortunately. Short-term troubles? You mean the eight years since 2000? 2000 was the year I first invested in I-Bonds. 2001 was the year I first started investing in TIPS. My long-term objectives are fairly constant. Don't lose money needlessly, but if money must be lost (due to inflation and/or taxes), then at least lose less. Small investors pumped $10.4 billion into mutual funds and exchange-traded funds specializing in Treasury Inflation-Protected Securities over the last year, driving up the price of TIPS and thereby lowering future returns. $10.4 billion? That's it? It took an entire year? Wow. Beware the herd apparently. It must be composed of Dachshunds since they're so hard to spot. That's about three or four days worth of trade deficit, about one day's worth of writedowns at a given major investment bank, or one month's worth of Citigroup's lost market cap (over $100 billion missing in the last year). Take your pick. Oh the humanity. You know the top is in when your taxi cab driver can't get enough TIPS? That's just a pun though! It was never intended to be taken literally. In January the government issued a ten-year TIPS at $99.14 per $100 with an after-inflation yield of 1.7%. It now sells for $101.05, and the yield is down to 1.5%. Wow. I did pretty good in January's auction it seems. But is 0.2% less yield really a reason to be alarmed? January's 20-Year TIPS auction went the other direction though (rates went up 0.3%). I'm actually underwater overall since January. I guess that point is conveniently forgotten in the rush to make the TIPS market look so unattractive. However, I can still get a 1.7% 12-month CD at US Bank. No joke. It doesn't even have any pesky inflation protection at all. Instead of getting 1.5% over reported inflation, I'd be getting 1.7% over zero. Decisions, decisions. Why are retail investors falling all over themselves to buy TIPS? Because they are in a panic. The price of gasoline is going up, and TIPS have the specious appeal of beating the cost of living. They are missing the big picture. Well, there you have it. I'm in a panic. It says so and I believe everything I read. I'm chasing the specious appeal. I'm missing the big picture. I should have all my money in the stock market since there's no way to get a decent yield anywhere else. Safety be damned even as both Soros and Buffett see problems both behind and ahead of us. We can't prove it, but we suspect that most of the people buying ten-year Treasurys today aren't buying because they expect terrific returns over the next decade. They are buying because they witnessed great returns over the past year (great compared to stocks, at any rate). Yeah, I'll bet you can't prove it. Way to berate us "speculators" with idle speculation. I've been buying since 2000 and will continue to do so. It has nothing to do with the returns over the last year. Further, who expects terrific returns anywhere going forward? Not me. How about the government's recent decision to reduce the maximum amount of I-Bonds we could buy from $30k to $5k? How about that I-Bond real rate being lowered to 0.0% to discourage us even further? Perhaps the government "witnessed great returns over the past year" and wanted to put a stop to it too. Just like you are doing. TIPS [Treasury Inflation Protected Securities] are not a bad investment for people worried about inflation heating up, which we're seeing signs of. Since I consider this article fear mongering in an attempt to put our somewhat "safe" money into something far riskier, I offer some fear mongering of my own. Rates remained stuck at around 100 percent for most cash investments, with the longer dated 60 to 90 day investments attracting the higher rates of around 150 percent, with inter-bank overnight placements trading at rates below 20 percent, an analyst with Kingdom Stock Brokers (KSB) said. 100% interest rates aren't all that good when you've got million percent inflation. "All money market investments at the moment are yielding a negative real return of 100 percent, meaning that at maturity of one's fixed income investment, the investor will have gained absolutely nothing," said the analyst. What fun! Oh, you don't just gain absolutely nothing. That's a bit misleading. You also lose nearly everything you started with. If real returns dip like that here in the mighty USA, and TIPS do best in a falling real yield environment which they do, I'll be buying all of Forbes for worthless pennies on the worthless dollar! Mwuhahaha! Well, either that or buying the last loaf of bread once the government taxes me on my "profits." Tough call. "People talk about 'stagflation,'" he said. "I don't think they're using the right term. The actual true definition of stagflation is not higher inflation and slower growth, it's actually higher inflation and slower potential growth." I'm certainly not acting like a pure stagflationist would. I'm a paper stagflationist in TIPS and I-Bonds. I have no great desire to hoard oil, gold, and silver these days. On the other hand, I still see value in toilet paper and other items which have not seen huge price increases. I'm not sure what that makes me. Confused? Why is there a disconnect? In this instance, he says, the American economy has actually imported its inflation. I would argue that we laundered our 'flation. We exported inflation (our primary export is paper dollars and has been for years) and imported deflation (cheaper goods). Lately, our money launderers are being overwhelmed. There is only so much inflation they can launder for us. The free lunches are getting expensive for everyone now. We pushed our luck. "We've imported this commodity inflation," he said. "Outside of commodities, when you go to the CPI, you'll see a whole swath of stuff that's still running negative year-on-year, that was running 10 to 15 percent price growth rates back in the 1970s." I do believe that. There is a disconnect. I keep bracing for the commodity inflation to spill over in a major way but it sure is slow going. It may not come in my lifetime (which would be fine by me as a saver). Who knows? There are just so many deflationary forces (excess debt, excess banking capacity, excess restaurant capacity, excess mall capacity, excess consumer capacity, excess Chinese capacity, excess workers, ...) offsetting it. Since we seem to think we're now importing inflation and there's nothing the Fed can do about it, I'd say our money laundering [Ponzi] scheme worked out rather well. Wouldn't you? Too bad people can't seem to remember we exported it first. They are using US dollars to buy oil aren't they? Where'd they get them? If the market follows its typical seasonal pattern, Schork thinks crude's "highs have been put in." I have two holes to blow in his theory. Here comes the first hole. I put 32 years (starting in 1976, as far back as I could go) of monthly gasoline data through the Census seasonal adjustment program. Want to guess what the output said? WARNING: Series should not be a candidate for seasonal adjustment because the spectrum of the prior adjusted series (Table B1) has no visually significant seasonal peaks. I'm not even going to supply a chart this time. There's nothing to see. Instead, I offer the seasons when gasoline prices peaked for the year so that you can see the lack of things to see for yourself (sarcasm and humor intended). For the following data, I am starting spring in March, summer in June, fall in September, and winter in December. For simplicity, I am using the calendar year to determine it (i.e., January, February and December of 2007 are considered 2007's winter). Here comes the second hole in the expert's logic. It is still spring (March, April, May). Even if you do somehow manage to buy the argument that this data has some seasonally significant trends (which is very much open for debate at best since the program's output says otherwise), then we're not even to the seasonally statistically important part yet (summer). So why would we therefore assume prices have already peaked based on seasonal concerns? That's not to say that prices aren't peaking. Who knows? I'm simply arguing that the expert's logic has two seasonally adjusted holes blown right through it. Lies, damn lies, and statistics strikes again. Is it any wonder that I find it so hard to trust any financial advice these days? Everyone on Wall Street has their own agenda and very little of it has anything to do with protecting us. That's about the only certainty there is these days. Am I done yet? Nope. As I have stated in recent posts, I have a tremendous fear of under heckling. I rank it right up there with my fear of borrowing money to sustain the unsustainable. As consumer confidence wanes and prices at the pump continue to climb, demand for gasoline has softened. Tuesday's report provides further "anecdotal evidence that demand is drying up," Schork said. What's the anecdotal evidence ("Compare with hasty generalization") and/or hasty generalization ("basing a broad conclusion upon the statistics of a survey of a small group that fails to sufficiently represent the whole population") coming out of China? Are we still sending billions of people our money through a massive trade deficit so that they can learn to drive? Or have they finally figured out that our paper IOUs just don't buy as much as they once did? Here's some scientific evidence, for what that's worth these days. It states that China's increasing its refining capacity by about one-third in the next few years. In 2008, China will bring four new refineries into operation: China National Petroleum Corp. (Sinopec) in Qingdao, Shandong, and Quanzhou, Fujian; China National Offshore Oil Corp. (CNOOC) in Huizhou, Guangdong; and PetroChina Co., Ltd. in Dushanzi, Xinjiang. Overall, China's refineries will supply an additional 400,000 bpd of fuel, more than double last year's increase, according to a Reuters survey. China plans to expand its refining capacity by about one- third by 2010. Most investors, she says, can't afford "not to have money grow at all." "Sooner or later, we think, the increases in value of the stock market and homes will not be great enough to reassure most Americans that they have enough savings, but right now, it hasn't stopped," he said. "It explains the continued strength of the economy." Sooner or later has a nasty way of sneaking up on a person. 'This is a period of wealth destruction. The people who make money will be few and far between. There will be a lot more money lost than made." I'm a believer since 2004. That's why my blog is named Illusion of Prosperity. It is and has been my goal to simply lose less than the next person. It also explains why I think toilet paper is a relative bargain and why the majority of my net worth is sitting in TIPS and I-Bonds. If I end up losing money (which I may if inflation truly spirals out of control), heaven help the fence swingers. "I think the dislocations will be greater because you also have the implications of the house price decline, which you didn't have in the 1970s - so you had stagflation and transfer of purchasing power to the oil producing countries, but here you also have the housing crisis in addition to that." Deflationary Great Depression meets 1970s style stagflation. In the grand [ponzi] scheme of things, does it really matter what the inflation rate ends up being? I see no way these two wrongs can make a right. The trends are not our friends. In the UK, the economic clouds are particularly dark, he says. "House prices have risen over the years and are further away from sustainable than in practically any other country, in terms of household indebtedness and the relationship of house prices to incomes." The slump may be more gentle than in the US, he adds, but it will be more drawn out. Once again, this is not investment advice. Please don't take it as such. I've been a bear for nearly four years. It is always possible that I'm pessimistic as opposed to realistic. In any event, I'm still questioning my financial sanity. Therefore there's at least a decent chance that I might not be financially insane. Who knows? "At the end of the day I'm managing money for other people and I don't like losing money and I don't like being played for a fool in terms of transparency and accountability,'' 452 Capital's chief executive Peter Morgan told Sky News. Peter Morgan, I am speaking to you. But Mr Morgan said IAG's brand had been muddied in the past, and poorly managed. Which is it? First you say you were played for a fool and now you say you understood the risks. "There is no acceptance of past mistakes and I think that breeds complacency and I think it's time the company itself put its hand on its heart and started telling all shareholders what is going on and why it is going on,'' he said. Like the kind of complacency that would make you one of the company's largest shareholders? If it turns your stomach to lose other peoples' money as you say even as you invest using your own words in "poorly managed" and "muddied" branded companies, then there's an obvious stomach turning solution. No, this is not Seppuku advice. I'm actually suggesting Maalox. Well, sort of anyway. There are far cheaper generic versions at Wal-Mart. This Seppuku story was inspired by comments left for me by AllanF. Spain has run up the world's second highest current account deficit during a decade of debt-fuelled growth and consumer spending is plunging now that households and firms face credit restrictions. This somewhat proves the old adage. When in Spain, do as the Americans do. No wait. That's not it. When in America, do as the Romans do? No. When in Rome, do as the Romans do? Nevermind. Heck, just hand me a fiddle so I can play while our prosperity is burned. Surely there must be some good news. That's the good news? Does that sound like good news for our many malls, restaurants, and auto dealerships? Higher wages are blamed for the stagflation of the 1970s. I'd just like a believer in this theory to explain why wages did not keep up with inflation in the 1970s then. Real wages peaked in January of 1973. The nastiest part of the stagflation didn't hit until the late 1970s though. Similarly, real inflation adjusted wages appear to be peaking yet again. If history is any guide and wages have anything to do with it at all, then the rising wages during the late 1990s have already done the damage. Right? I play both sides of this fence as you know. I wouldn't argue. Inflation is a genuine fear and so is deflation (we are seeing home price deflation). To me, that simply says we're VERY highly leveraged. What I'd really like to know is what inflation will be doing over the next 20+ years. I'm not optimistic. In any event, a deflationary outcome would be even more devastating to the global stock markets. It would also inspire Ben Bernanke to increase helicopter production as a way to ensure our future prosperity. Maybe that's why I am not optimistic. It somewhat stinks being a bear. We have to choose a proper defense. What works during deflation kills us during stagflation (and vice versa). The bulls have it much easier. Just buy stocks. Use both hands. Load up. You simply can't lose. I therefore have opted to play the relatively wimpy middleground with I-Bonds and TIPS. I won't take much damage if any during a deflationary crash and I will have at least some protection against inflation (although serious hyperinflation would wipe me out). In the words of Greenspan, there is no safe store of value. This is not investment advice. If I had good investment advice, do you think I'd be sitting in I-Bonds and TIPS? What's particularly troubling about oil's rise is that everyone knows it will affect the economy, but no one is sure exactly how. Experts are split over whether it will cause broad-based inflation, further economic weakness, or both at the same time. I hope the experts are still makin' the big bucks. Stagflation is growing in popularity lately. You'll note that the popularity began about the point I started my blog back in August of last year. I assume that you're telling two friends, they're telling two friends, and so on, and so on. You know, because the universe revolves around me, this blog, and what not. As much as I'd like to think that, unfortunately I think it is more likely that the country really is in trouble and I'm just one of the many meager ants pointing out the massive magnifying glass over our ant hill. Of course, the bullish contrarians would argue that since everyone has finally begun to notice, the danger has passed and it is time to invest in flammables. So what do we do in this type of environment? Let s look at the last time we had stagflation. The obvious play is commodities, but they have had such a run, that I am too much of a chicken to buy them. A lot of people got rich in the commodities markets the last time we had stagflation. A lot of them went broke, as well. If I want to lose that much money that fast, I will get married again! Warren Buffett and a lot of other value investors got very rich back then by being patient and buying stocks at ridiculous prices compared to their asset values. I think we will get the same chance again. I thought I had the chicken market cornered. It seems I am not alone though. The obvious plays tend not to work so well long-term. I can say with utmost certainty that it did not feel like a sure thing when I bought commodities in 2004. I was scared to buy and scared not to buy. I felt the same way when I sold in 2006. Toilet paper and canned goods I'm tellin' ya. Both are still cheap historically. Further, even if you are wrong you can flush them down the drain and/or eat your losses. No big deal. It seems the obvious play when you expect stubborn inflation, slowing growth, and raw commodities have already had such a run. Barring that and/or assuming you have billions of dollars just lying around waiting for better than toilet paper opportunities like so many others these days it seems, well, good luck! Come to think of it, maybe billions of dollars just lying around waiting for opportunities is part of the problem. There sure seems like a lot of money in the hands of people who don't give much thought to $4 gasoline. It isn't like a billionaire puts 3% of his income in his gas tank each year. Fortunately, he doesn't put 3% of his income directly into toilet paper and canned goods purchases either (that's why they are relatively cheap still). Of course, if you think the recent meteoric rise in commodities (oil doubling in the last year) might actually lead to a bit of headline CPI inflation in the future (stranger things have happened), there's always TIPS. I'm just saying that the last time we had stagflation real interest rates (after inflation) of all durations turned negative. You could not earn money off of money (after inflation, much less taxes). Since TIPS do best with falling real interest rates, well... I've probably already said too much. Further, if you think headline CPI inflation is baked-in even if commodity prices remain level, then TIPS would capture that inflation. That is and has been my thinking anyway. This is not investment advice. I'm simply saying what I have done, as a chicken and a hoarder of frozen chickens (birds of a feather flock together). It seems we are long past the no harm, no foul salad days and well into the more harm, more fowl hoarding days. It wouldn't be the first time. If you are illusional or delusional, this is must see TV! Bob Pisani: Don Luskin, am I delusional here? ... The bulls' scenario seems intact. Am I delusional about this? Don Luskin: No, no, you're not delusional. It's the bears who are delusional. Marlene Jensen talked me into using a price that was 20% higher. She said nobody would notice the difference between it and my previous price. She was right - I never heard a peep about the price increase. But the shocker to me is that my renewal rates went up - from 90% to 95%! Great advice! I think someone is using the advice in this book over and over again on crude oil. Allow me to demonstrate. We managed ten in a row before things really started falling apart (the credit crisis in August of last year). We managed three more 20% increases since then. I'm not a superstitious person, but for whatever reason I must admit that thirteen 20% increases in the price of oil doesn't seem all that lucky to me. The next stop is ~$141.98. Feeling lucky? In any event, I find comfort that very little of these price increases have trickled through into plastic toys made in China yet. We can still count on cheap goods from China into the distant future just like we always have been. Right? Mattel (MAT, Fortune 500), the world's largest retailer and maker of iconic toy brands such as Barbie, Hot Wheels and Elmo, said Monday that the company will raise prices for its brands in the mid-single digits by June. Oh crap. It is almost June. Forever time flies when you're having fun. Glassman's investment advice today is good. He is right when he writes that "stocks are a far better place than bonds and cash to put the vast majority of your money for the long run." But his flat-out claim that this "was the unequivocal message of [Dow 36000: The New Strategy for Profiting from the Coming Rise in the Stock Market]" is flat-out false. That "stocks are a far better place than bonds and cash to put the vast majority of your money for the long run" was the unequivocal message of Jeremy Siegel's Stocks for the Long-Term. Glassman and Hassett may wish that they had written the book that Seigel wrote, but they didn't. Is it good advice? Are we sure? The jury is still out on Jeremy Siegel's "far better place" theory. The DJIA was 10,547.06 on December 6, 2004. It is now 12,479.63. It is taking massive economic stimulus (deficit spending) and a tanking currency to get that 4.9% average annual increase. A better place perhaps (if one can stomach the risk), but far better? Further, that same stimulus and currency debauchment wasn't enough to keep real estate climbing (historically also a "far better place than bonds and cash"). Toilet paper is currently beating the Dow by a wide margin. It too is a paper product. We'll see it if can keep it up long-term. To be fair, toilet paper is not generally regarded as an asset class (pun alert!) but can be very useful if the you know what meets up with the fan (ba-dum-ching). The I-Bonds from 2000 and 2001 are paying 3.4% over the CPI and will do so tax-deferred until 2030. I wish the government hadn't put a limit on how much could be bought. At the time, few thought they'd have a hope in heck of beating the Dow over the long haul either. A gambling man these days might assign them even odds. Perhaps the stock market can continue to climb this wall of worry though. On the one hand, we've got Ben Bernanke who has studied the Great Depression in great detail (while simultaneously putting some of his own money in Canadian Treasuries). That's gotta be good news for us. On the other hand, we're all fighting Imelda Marcos Economics. There's just so many shoes! And now for the main event. Here are Jeremy Siegel's thoughts from the past. DOBBS: When you say that is it -- that there are positives in the loss of all of these jobs that are being exported to China, to around the world, it seems at best counterintuitive. SIEGEL: It does seem that way. But there is a very important other side that I think Americans should realize. And that is that when China or India can produce goods and services cheaper that means that we, as consumers -- and we're all consumers -- are able to have our income go further, stretched longer, increase productivities. My belief -- a lot of the increase in productivity we're seeing is really because of a lower cost of goods for China. Should have just ended it on that in my opinion. We send them tons of dollars (paper IOUs) and in return they send us tons of goods we can actually use? What's not to like? Oh yeah, now I remember. Those dollars lose their value at some point. What could happen on the down side? There is always something to worry about. There’s always Iran to worry about; there’s oil going to $100 a barrel or who knows, even higher. My feeling is that the bubble is going to burst before we’re going to get that high. I think that we’re going to suddenly see some very down days in commodities and that’s going to be ultimately encouraging. Once commodities settle down and people realize, “Wow, housing is under control, commodities are finally under control,” they will become very bullish on equities. That is a very good scenario for the large cap stocks worldwide. I know what you are thinking. Someone must be finally spending all those dollars we sent to China. No? Please tell me you aren't thinking... Wow. Housing is under control. Commodities are finally under control. I am becoming very bullish on equities. This is a very good scenario for the large cap stocks worldwide. Should We Worry About the Plunging Dollar? All told, we do need to worry about the plunging dollar. We are now at the point where the Fed has done enough to stimulate the economy by lowering interest rates and must turn its attention to the inflationary implications of the sinking dollar. I hope that the recent hints that Fed is done easing are enough to strengthen the dollar. But if they are not, the Fed must reverse direction and raise interest rates. Ultimately price stability will benefit our economy far more important than the short-term stimulus of another rate cut. Why weren't you worried about it when we were sending all those dollars and jobs over to China? How many chapters in your Stocks for the Long Run were dedicated to our massive deficits? We haven't had those for the long run. Or can I simply ignore them entirely? I have no idea. I haven't read the book. Social Security will be bankrupt by 2016. Or 2046. Or maybe never, depending on which politicians are jiggling the numbers. Critics blame the tax cuts, warning of $7 trillion shortfalls. But Wharton Economist Jeremy Siegel says a one-percent change in productivity estimates and the problem disappears. Still, the administration promised to privatize Social Security, giving Wall Street access to trillions of new fee-generating assets. Unfortunately, privatization will not take care of the system's underlying structural problems and America's declining savings rate. I do love an economist optimist. The rhyme has a nice ring to it. You know you've got one when the "one-percent change" is always assumed to be in the right direction. However, you will note that in 2003 ("My belief -- a lot of the increase in productivity we're seeing is really because of a lower cost of goods for China. "), Jeremy Siegel considered China to be the primary driver of our productivity gains. Now the rage (literally) is that we're beginning to import inflation from them. Oh oh. There go our productivity gains right down the productivity toilet. I just want to make sure I don't under heckle. I really don't want to take on any additional risk these days. We are in very big trouble as a country, and I've never been more convinced of it. Kimberly-Clark (KMB: 62.96, -0.74, -1.2%) said prices will be 6% to 8% higher on Kleenex facial tissue, Cottonelle and Scott bathroom tissue, Viva paper towels, Huggies diapers and Pull-Ups training pants. Oh yeah. That's what I'm talking about. I'm earnin' 6% to 8% on hoarded facial tissue, bathroom tissue, and paper towels. I feel SO much wealthier now. I'm certainly not going to be cutting back on my spending. TPEW (Toilet Paper Equity Withdrawal)! Disneyland here I come!! Fine Print: The hoarding is real but the reaction is both sarcastic and illusionary. There was a guy on CNBC this morning who said that this is not just a cyclical downturn but a structural shift. He spoke of consumption being high in the past because people "felt" wealthier (illusion of prosperity). It encouraged people to save less, take on more debt, and extract equity from their homes. Those days appear to be over (whether the consumer wants it or not). Here are a few charts that show a structural shift. 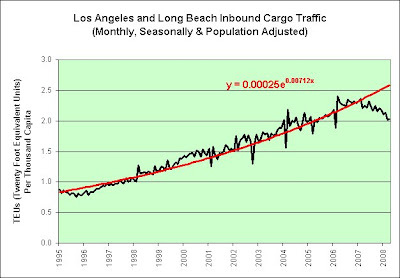 April's container traffic is out. This is a structural shift. It is no longer following a very well established exponential growth trend (nor is it likely to return to it). Further, I'd like to point out that this isn't just a case of data mining to find patterns. Data mining is dangerous because looking through the data to find patterns isn't nearly as strong as starting with a theory and then using the data to back that theory. The theory came first in this case. 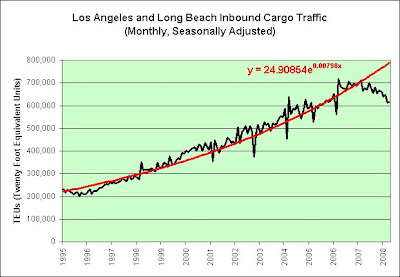 I've been bearish since 2004 (long before inbound container traffic turned down). It was and is my belief that our massive trade deficit combined with negative real interest rates was not the sign of a healthy sustainable economy. I have/had many questions and I'm really not liking the answers so far. Are we becoming tapped out? If we become tapped out, will Ben Bernanke live up to his helicopter nickname even if oil is $80 a barrel? Devaluing our way back to prosperity isn't working though. "AMERICA'S OIL CRISIS" is now seemingly a permanent fixture at the top of CNBC. That's probably a sign we're close to a top though. Heaven help us if we're not. Even if oil does back down from here the long-term inflationary pressures will still remain (countering the long-term deflationary pressures of falling house prices and a slowing consumer). It takes time for higher oil prices to trickle through the system. It seems very likely that 2008 oil prices will average more than 2007 oil prices. That could very well be the undestatement of the year. Crude oil (WTI - Cushing, Oklahoma) averaged just $72.34 in 2007. Here's a disturbing UK statistic to ponder. It doesn't imply prosperity is alive and well. The number of hospital admissions linked to alcohol has risen 7 per cent in one year and more than doubled in 12 years, figures showed today. From 1995/1996 to 2005/2006 the rate of increase averages 7.5% per year. From 2005/2006 to 2006/2007 it has increased 7.3%. Statistically speaking, this is just like clockwork. The extrapolator in me using a modest 7% annual increase predicts that in 100 more years there will be 180 million alcohol related admissions. That's pretty impressive for a country that will have 80 million people at most in 100 years (61 million growing at 0.276% per year). You know what they say on Wall Street though. The trend is your friend. I think this same sort of math can be applied to the price of oil. 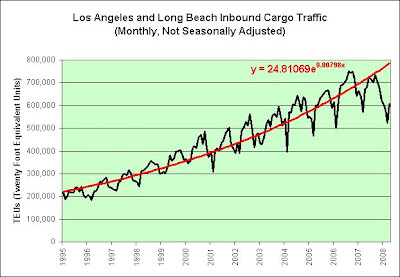 At some point exponential trends simply become unsustainable, no matter how impressive the fundamentals appear. Now consider the situation today in oil markets: the Gulf, according to Mr Rothman, is crammed with supertankers chartered by oil-producing governments to hold the inventories of oil they are pumping but cannot sell. That physical oil is in excess supply at today's prices does not mean that producers are somehow cheating by storing their oil in tankers or keeping it in the ground. All it suggests is that there are few buyers for physical oil cargoes at today's prices, but there are plenty of buyers for pieces of paper linked to the price of oil next month and next year. This situation is exactly analogous to the bubble in credit markets a year ago, where nobody wanted to buy sub-prime mortgage bonds, but there was plenty of demand for “financial derivatives” that allowed investors to bet on the future value of these bonds. This is why I cannot invest in oil at these prices. I have no way to verify the claims by the bulls or the bears. In any event, there can be no argument that the best time to invest in oil was when it was just 8% of its current price (i.e., ~$11 a barrel heading into the dotcom bust in 1998). 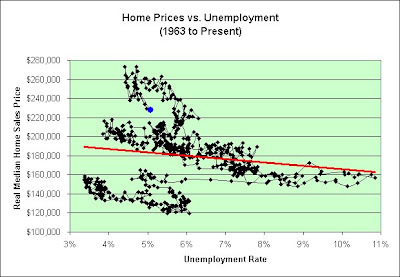 I have compared the real median home sales price (including land and adjusted for inflation), the unemployment rate, and the yield of the 10-Year Treasury in the following charts using data going back to January 1963 (as far back as I could using the data I had). The blue point represents where we are now. In red is a linear regression trend line. In the chart above, the blue point is generally heading down and to the right lately. In the chart above, the blue point is generally heading down and slightly to the left lately. As can be seen in 45 years worth of data, there is a substantial risk it will begin heading to the right at some point. In the chart above, the blue point is generally heading up and slightly to the left lately. Heaven help us all if it starts moving up and to the right in a meaningful way. In my opinion, it would severely test the deflationists. For example, Zimbabwe with its 80% unemployment has one million percent inflation. "The last period we had a sustained period of stagflation, the only way we got out of it was through aggressive rate hikes that shocked the system. The fact rates will have to go up is what people are worried about," he added. Keeping my name yet another month it seems. He never did end up killing him. I never end up changing my name. It's probably just a coincidence that I feel like I'm in a pirate movie. There's certainly been plenty of plundering regardless. What will it take to make Hillary stop? Whatever her reasons for staying on, she has to balance them against her $20m debt, which grows every day she remains in the race. For the moment she looks like she's in it for the long haul. Wheel of Fortune has three contestants. If you spin and it lands on bankrupt, you are supposed to pass your turn to the next person. What's the harm? It isn't like McCain or Obama are likely to solve the puzzle. That being said, what we really need in a president is someone who can embrace the growing of debt every day and do so for the long haul. Yeah, that's exactly what we need. Future prosperity! That's what I'm talking about. I apologize for using DEFCON 1 level sarcasm in an attempt to avert a potential financial crisis. It just seemed the proper course of action. The highest alert condition the US military has been confirmed to have been at was DEFCON 2. Higher alert conditions were also ordered during the 1973 Yom Kippur War. While the US military was technically at DEFCON 3 status during the Yom Kippur War, in certain theaters it operated under DEFCON 2 conditions as a show-of-force to repel Soviet naval vessels from entering the Bosporus Strait. For example, Pershing I missiles in West Germany were prepared for use. 1973, oh how you haunt me! If you thought the worst is behind us, or that the credit crisis hit bottom in the first quarter, or that there are signs that the loan market is coming back, or that Wall Street firms are finished with their capital raising, Meredith Whitney has three words for you: You are wrong. It is clearly personal and emotional, which to me is a very dangerous mindset to have when investing. The credit meltdown runs so deep that the prosperous years on Wall Street that began in 1982 are probably drawing to a close, says Barton Biggs, 75, managing partner at Traxis Partners LLC, a New York- based hedge fund. The golden age appears to have ended in 2000. It is possible that stocks will do okay in the future but the 1980s and 1990s are over. We need to get over it. TV shows such as "Fast Money" and "Mad Money" tell me we haven't. As comments left for me have stated, if one must panic at least panic first. Economic slow-downs are measured in months? I guess we're starting our historical analysis beginning in 1982 again. Why is that such a popular starting point? 1965 to 1982 was nearly "several decades" and investment returns were very poor. But hey, that was a time of rising oil prices. What are the odds of that happening again? Based on the survey, more than half (54 percent) of affluent boomers cited higher returns on investments as a primary goal for the next five years. “This finding underscores the fundamental lack of understanding many investors have about risk and return. Boomers will not achieve higher returns if they shift to more conservative investments as the survey findings suggest,” said Bell. He recommends that boomers retain a healthy portion of their assets in growth-oriented equities, so that their nest egg continues to grow. That's one way to look at it I suppose. I might suggest that 46% do not cite higher returns as a primary goal. That would include me. I just want to protect what I have. Further, I would argue the author has a fundamental lack of understanding about risk and return. Taking on more risk does not guarantee higher returns. The nest egg continuing to grow assumption would fall apart if the risk actually kicked in. The company said profit margins declined slightly from last year because sales grew faster in low-margin categories, which generally includes food and essentials like paper towels. Why would paper towel sales be growing faster? Do people suddenly make more messes at home that need to be cleaned up? I find this very hard to believe. Nah. I'm just joking. I've got a LOT of paper towels too. If people are going to hoard them, they'd be better off getting a Costco membership and buying in bulk though. Once again, I do not think there will be a paper towel shortage. I just happen to think paper towels will outperform three month treasury bills as an investment. That's all. Inflation expectations are contained my you know what. Circling back to the Capital One (COF) presentation at the Lehman Brothers Financial Services Conference for a moment, we noticed an interesting slide from the materials COF presented showing the relationship between credit card delinquencies and unemployment. Now, intuitively, we would think that rising unemployment would certainly restrain credit card payments, worsening delinquencies. But, according to Capital One, we would be wrong. There's a very interesting chart that's worth a look. It does not bode well for future unemployment. 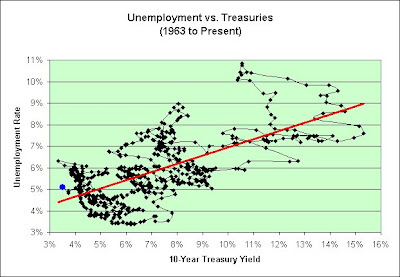 It seems deliquencies come before unemployment, not the other way around. I certainly would not have guessed that. I once again want to know how we start an economic recovery with oil at $127. NEW YORK (AP) -- Wall Street pitched lower for the second straight session Wednesday as record-high oil prices and a bleak economic assessment from the Federal Reserve deepened investors' worry that Americans may face several more months of rising costs and a shaky employment picture. The Dow Jones industrial average fell 227 points, logging its widest two-day loss since late February. I now want to know how we start an economic recovery with oil at $134. I think Greenspan should write a children's book sequel to The Age of Turbulence. He could call it The Age of Parabolas: A Pop-up Economics Primer. The pop-ups should come out at least five feet to do it justice though. Design and creation of such books is known as paper engineering, a term not to be confused with the term for the science of paper making. Who better than Greenspan? Okay, okay. You've got me there. Bernanke could be a co-author. I went to Costco today. The parking lot was fairly packed an hour before closing time on a weekday no less. It seems I was not alone. There was no basmati rice, again. There was a sign over the brown rice this time that said there was a five bag limit. Costco's rice shortage has clearly reached the Seattle area. It would seem to me that hoarding starts at the bottom and works its way up. Rice is at the very bottom. Bedpans would likely be the very top. Here is my favorite story that illustrates this. Before he died, I knew Dr. Norbert Einstein. He was Albert's cousin. He was a banker. He told me that only late in the German inflation did his Aunt Rosa catch on to what was happening to the value of money. She then wanted to get into goods and out of money. But the truly marketable goods were gone. They were being hoarded. All she found was a large inventory of bedpans. She bought them in late 1923. Then came the currency reform of December, 1923. It produced the recession of 1924. There was Aunt Rosa, figuratively sitting on top of a pile of bedpans. We've been testing the deflationist for 5 1/2 years so far (since the article was written) and all we've managed to get out of him/her was $130 oil. That being said, it is possible that the hoarding of rice was the top of the cycle. See the parabolic chart below that's clearly breaking down. I have no idea where inflation is going to head in the short-term (hence my neutral short-term inflationary mood as seen in the upper left corner), but I'm sticking to my long-term stagflationary outlook just the same (as it relates to falling real yields but not necessarily parabolically rising commodity prices). I've based my outlook on one simple (Keep It Simple Stupid) idea. It will be increasingly difficult to make money off of money in the future. That's it. That's my primary prediction. I'm not a big believer in "sure things" as some of you already know, but the odds do/did seem heavily tilted in my prediction's favor. I started this blog just a few days after the credit crisis I might add. It is very difficult to make money off of money when there is a concern you'll lose it all. Safe really is a happy word you know. I'm told that we'll bounce back later this year and things will be fine again. I'm firmly in the once bitten, twice shy economic theory camp though. I can't speak for others, but I've been twice shy since the economic meltdown of 2000. I would even go so far to say that we're still in it. Some are actively trying to convert an Illusion of Prosperity into something more tangible. Rice comes to mind. A YEAR from now, most Americans will be earning more than they are today and enjoying the first real gain in buying power since 1968. The outlook for the economy in 1972 can be summed up simply: growth. Old-fashioned rapid, sustained growth. Best of all, real growth in incomes, jobs, profits, sales and production, rather than the illusory rise in dollar totals that comes from inflation. 1972. Good times. Good times. Internationally, the world financial system was shaken by the determined U.S. campaign to cheapen the dollar against foreign money. The campaign climaxed three weeks ago in a sweeping realignment of currency values that cuts the dollar down to size and makes U.S. products less costly—and more competitive—in world markets. The new deal creates the opportunity for crafting a new, more realistic and more flexible system to finance global trade and investment. Yet in terms of the numbers that mean most to businessmen, workers, consumers and investors, 1971 was a distinctly disappointing year. Real gross national product—the value of output minus the cost of inflation —rose by an anemic 3%, about half the rise that is normal for the first year of recovery from a recession. The rate of price increases declined only slowly before the freeze, averaging around 4% for the year v. 5.5% in 1970. Unemployment climbed to a peak of 6.2% in May, and hung stubbornly close to that level for most of the year. The combination of unemployment and inflation frightened consumers into a particularly wary mood, and the deficit budget that Nixon unfurled early in the year—in another philosophical defiance of G.O.P. tradition—proved insufficient to spur the spending necessary for prosperity. The stagflation party might just be getting started. But while he said the US recession would be "more serious than currently anticipated and certainly longer," he warned that in the UK "the situation is in some ways perhaps worse than for the United States." In America with its severely weakened currency? Perhaps, but let's look to Canada and its stronger currency instead. It doesn't take shortages of goods to inspire hoarding. All it takes is savings and/or wages not keeping up with inflation. For example, I'm not hoarding toilet paper because I think the world will soon run out of trees. I just think it will outperform three month treasury bills as an investment. Bernanke desperately wants the world to spend its money. Well, it sure is working. This isn't prosperity talking though. This is a short-term Band-Aid with long-term consequences. The Reuters/University of Michigan Survey of households showed inflation expectations rising to 5.2 percent over the next 12 months, the biggest jump since 1982. ``My expectations for moderating inflation and limited spillover effects from commodity price increases depend critically on the continued stability of inflation expectations,'' Kohn said. I'm sensing something wrong here. Maybe that's just me. The cause of stagflation was accelerating inflation in the US and the rest of the world during 1969-74, a falling US dollar, and depressed aggregate demand in the rest of the world. Based on the data for the seventies, it could be argued that the drawn out inflation since 2003 has gained a strong enough momentum in 2008 to cause a period of more severe world stagflation than the one experienced in the 70s. The severity of stagflation will stem from very low interest rates, unsustainable credit expansion, severe limitations on oil and food supplies and abnormally high energy and food inflation. All these factors will contribute to intensifying inflation and at the same time to crippling world aggregate demand and supply. Cut interest rates and then pause, such was the Fed's recent decision. Pause for what? For more instability? Maintaining the Federal Funds rate at 2% means that the Fed will supply any amount of liquidity required to achieve this target. This policy will depreciate money, put an end to prosperity, and disrupt world energy and food equilibrium. Other than that, things are looking pretty good though. DETROIT, May 19 (UPI) -- A collapsing market in large used vehicles is rippling through the U.S. automobile, industry observers said. "Consumers will be less able to use their current used vehicles as currency," Nesvold said. DEVELOPMENT: Food Crisis Rippling Out Like a "Tsunami"
At a forum on the world food crisis held at the United Nations Friday, civil society groups stressed that over 800 million people are now at risk of starvation, while 100 million have joined the ranks of the extremely poor in just the last few months and are now living on less than a dollar a day. Vanity doesn't stand a chance against a bad economy. The notion of having to postpone a nose reshaping or skipping eyelid surgery may not elicit a lot of empathy from consumers who are struggling financially after losing a job. Yet, plastic surgery is another business being hurt because consumers are worried about their shrinking discretionary incomes, which means it serves as another barometer of the rippling consequences of an economic downturn. Going forward, the fallout from record oil prices may result in more layoffs than the housing slump, John A. Challenger, chief executive officer of Challenger, Gray & Christmas. "The impact of high gasoline prices is rippling through the economy much faster than the housing collapse ever did or will," Challenger said in a statement. Of course, high gasoline prices and the housing collapse might just be related (attempting to devalue our way to prosperity). That leadership was important, because railroads are historically among the first areas that recover after a recession or economic slowdown. Railroads and select truckers have been recovering for several months, even before investors began to forecast that the worst of the credit crisis is over. I once again want to know how we start an economic recovery with oil at $127. Historically speaking, oil tends to be the cheapest during the downturn and it too recovers. Further, if one believed that oil prices would stay high or go higher then railroads start looking very attractive (since they can haul goods more efficiently). Market breadth was negative. On the New York Stock Exchange, losers beat winners 8 to 7 on volume of 1.15 billion shares. On the Nasdaq, decliners topped advancers four to three on volume of 2.27 billion shares. Historically speaking, market breadth is also important. But hey, at least the blue chips are still floating. How can an iceberg float? How is it possible that such an enormous amount of ice can float on water? The answer is easy to give, to understand it is another thing. I would have guessed inflation but apparently I would have been wrong. Or would I? Reinforced climbing handles provide reliable grip for hands and feet, while the industrial grade air valve allows quick inflation or deflation (the iceberg inflates in minutes with a common shop vac or leaf blower). When deflated, the iceberg fits in most SUVs and caravans. Due to the popularity of this item, we are unexpectedly sold out. Since the beginning of the credit crisis last summer, Fed policy has been purely inflationary - intended to convince people that they had more money and credit than they thought...and that they should spend it and invest it. But that policy can’t work forever. Eventually, consumer prices rise sharply. Then, the game is over...the Fed has to "lower inflation expectations" before it can inflate again. The hocus pocus only has a positive effect, in other words, as long as people are misled...once they catch, the jig is up. The jig really is up. I believe that. An entire generation has grown up with 1) a dollar with no connection to gold, 2) a dollar that actually rose against gold for 20 years, 3) Wal-mart’s Every Day Low Prices, 4) apparently inexhaustible supply of cheap labor 5) globalized markets and supply chains and 6) falling bond yields. No wonder people began to think that inflation was no problem...and never again would be. Central bankers claimed they could now control economic cycles so as to have growth without inflation...boom without bust...forever. But forever seems to have come to an end already. Well, we've still got a forever war. That's something I guess. The consumer is spent up, not pent up, and more levered than during any period in history. That's one of the structural problems facing the economy. At the same time, job growth is declining and real disposable incomes are pressured as inflation literally is eating away at the consumer's buying power. It is frightening that the consumer has entered this economic downturn with the most levered position in history. On top of that, we're facing four consecutive months of job losses. 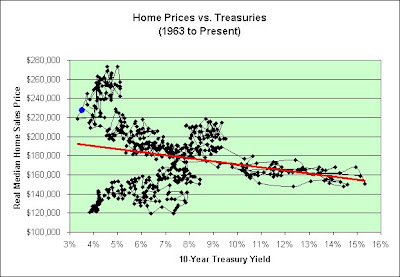 We've seen the depreciation of the two most important assets, home prices and equities. Consumer confidence is at a 26-year low. The availability of credit continues to be a problem that will plague the economy for a while. Inflation, the cruelest tax of all, is rising as energy and food prices, in particular, are soaring. And the first-quarter GDP report contained a number of ominous signs that the consumer is spent up while the housing depression continues apace. It is frightening and justifiably so. More than anything, I'm short Berkshire because of Buffett's recent investment-style drift. In the past five years, Buffett frequently called derivatives "financial weapons of mass destruction." Yet, very much out of character, he immersed himself in several large and thus far unprofitable derivative transactions, leading to an unrealized $1.6 billion pretax loss in the first quarter. I'm also short Berkshire because the salad days for insurance, which is the cornerstone of Berkshire's business, are over. Also, Berkshire's premium valuation seemingly has been a byproduct of the credit crisis, and the perception of the company as a safe haven. Berkshire's shares might underperform as some of the deflated financial companies regain their footing. And Buffett is substantially exposed not only to financials -- he owns large positions in Wells Fargo [WFC], Bank of America [BAC] and American Express [AXP] -- but also to a weakening housing market through his ownership of Clayton Homes. Buffett has also been saying that the salad days are over. I saw him speak at great length about future investment returns yesterday. I continue to watch real yields die. There's way too much money chasing too few ideas. A small fraction of that money has taken an interest in commodities. Heaven help us if the trend continues. Money that flows there hurts the "real" part of real returns for everyone else. Meanwhile, there's way too much debt. A small fraction of that debt has decided eating at home is cheaper than eating out. Heaven help us if the trend continues. We're a service economy. People better keep wanting service. Want really scary though? I think Ben Bernanke likes looking at the averages in a spreadsheet. I think that's why he didn't see the housing bubble coming. Averages don't show an accurate picture (one foot in boiling water and one foot in a freezer is not a comfortable experience). If you combine way too much money and way too much debt things can look fairly tame overall. Just one problem. The people with money keep seeing their money grow (after inflation). The people with debt keep seeing their debt grow (after inflation). I strongly suspect that both trends are unsustainable and are dependent on one another. The $168 billion needed for the rebates can come from just three sources: taxing, borrowing, or printing money. Raising taxes is simply not an option, politically, in the run-up to an election. The rebates thus will be funded through a combination of new deficit spending and currency creation. The former implies higher future taxes, to pay interest to bondholders and to retire the debt upon maturity; the latter intensifies the inflationary pressures already evident in the economy. Both will impose heavier burdens on the private sector and will augur slower economic growth. The currency is being diluted. In recent months, these financial companies have sold $262 billion in new securities -- much of it common and preferred stock -- according to Bloomberg data. This gives them capital they need to offset losses from subprime mortgages that now total $343 billion. Investors obviously don't see this as throwing good money after bad: They eagerly buy more shares than the companies initially planned to sell. The shares are being diluted. The loans in this group did not go to solid credits. Although market interest rates were low when these mortgages were written, the mortgages had rates averaging 11.2 percent. Yet investors who put up most of the money were willing to accept a floating rate of just 30 basis points - three-tenths of one percentage point - over the London interbank offered rate. At the moment, that gives them a yield of 3.2 percent. If Moody's is right, those investors will eventually suffer capital losses. That is quite a combo for a security: low yield and high risk. This is absolutely amazing to me and brings new meaning to the Death of Real Yields I speak of so often.